Make plans to attend KAFP-Foundation’s largest fundraiser, the Wine Tasting & Auction! This year’s event will be at Mark Arts, 1307 N. Rock Rd., Wichita on Thursday, June 6 from 7:00 p.m. to 9:30 p.m. This fun event is a great way to fellowship with your peers, sample new wines, and bid on fabulous wines and spirits donated by members! Attend the event! 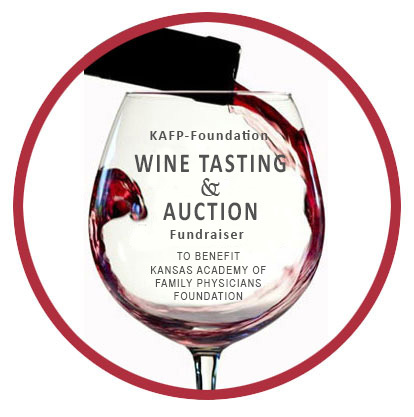 Tickets are $75/person and available to purchase with your Annual Meeting conference registration or as a separate event at KAFP-F Wine Tasting & Auction. Round trip shuttle service is available from the hotel for $10/person. Gift-in-kind donation. Wine or spirits are most welcome. Complete form and email kafp@kafponline.org or fax to KAFP at 316-721-9044. Monetary donations are welcome. Complete online form and receive a receipt. This is guaranteed a good time for all with proceeds benefiting the KAFP-Foundation. Thank you to our event supporter Wichita Surgical Specialists, P.A. Calling all residents and students! Don’t miss this opportunity to present a poster at the KAFP Annual Meeting! KAFP invites all family medicine residents and students to submit an abstract for research, a case study or a literature review for the 2019 Poster Presentation. The due date for receipt of abstracts is March 1. The Poster Presentation will be at the KAFP Annual Meeting, Saturday, June 8, 2019 at the Wichita Marriott Hotel, Wichita, Kansas. KAFP-Foundation will provide a $100 participation stipend for each poster presentation. And for presenters coming from more than 60 miles away we will also provide a room for one night in the conference hotel. To be considered, your completed abstracts must be received by March 1, 2019. Contact Michelle Corkins or call 316-721-9005 with questions. Tis’ the Season to Give and to Shop! There are two great ways you can support the KAFP-F through your shopping! Amazon will donate 0.5% of the price of your eligible AmazonSmile purchases to KAFP-F whenever you shop on AmazonSmile. Go to AmazonSmile and link your account to Kansas Academy of Family Physicians-Foundation. Dillons will donate a portion of each transaction to KAFP-Foundation when you use your Dillons Plus Shoppers Card linked to KAFP-Foundation. To link your card, visit Dillons Community Rewards. For details, visit: Amazon Smile & Dillons Community Rewards. https://kafponline.org/wp-content/uploads/2018/01/KSSPTG_web_large.png 0 0 Marina https://kafponline.org/wp-content/uploads/2018/01/KSSPTG_web_large.png Marina2018-12-14 16:21:482018-12-14 16:21:48Tis' the Season to Give and to Shop! As 2018 draws to a close, please remember KAFP-Foundation (KAFP-F) in your charitable giving. Your generous support ensures the continuation of KAFP-F programs to identify and cultivate future family physicians and offers numerous scholarship opportunities for residents and students. KAFP-F is a 501(c) (3) tax-exempt public foundation, and is the only charitable organization in Kansas that exists to improve and increase access to health care by investing in the specialty of family medicine. Contributions for 2018 must be received by Monday, Dec. 31, 2018. Still Christmas shopping? Go to AmazonSmile and select KAFP-Foundation as your charity. Amazon will donate 0.5% of the price of your eligible AmazonSmile purchases to Kansas Academy Of Family Physicians-Foundation whenever you shop on AmazonSmile. Celebrate #GivingTuesday the Tuesday following Thanksgiving on November 27. #GivingTuesday kicks off the charitable season, when many focus on their holiday and end-of-year giving. Please remember the KAFP-Foundation in your charitable giving. The Kansas Academy of Family Physicians, based in Wichita, Kansas, is the voluntary, statewide association for family physicians, family medicine residents and medical students in Kansas with 1,760+ members. The Kansas Academy of Family Physicians-Foundation is the philanthropic arm of KAFP, supporting initiatives to encourage family medicine. KAFP is recognized as a leader in developing and delivering outstanding education for family physicians in Kansas, for a strong advocacy presence in Topeka on behalf of its members and for its exceptional public health efforts. The KAFP and the KAFP-F boards are jointly seeking an executive vice president to help execute their vision for championing the cause of family physicians and their patients in the state of Kansas. The job description and application process are available at: KAFP EVP.